This is a true analog design percussion synth. This vintage style synth board will give you all the great sonic possibilities as only a true analog system can. Although this circuit is vintage technology compared to today's digital synth world, it is still the method most preferred by seasoned professionals for tone versatility, ease of use, and responsiveness to "on the fly" patch changes. Direct control parameters are completely step-less giving you infinite control combinations. Whether its melodic tones, or the sounds of sweeps, pops, blips, you name it...... this Percussive Synthesizer kit will provide you with an endless variety of sounds. Triggered by drum pad, piezo, or MIDI, the unit is dynamic and level dependent. There are three oscillators. Oscillator 1 and 2 produce an adjustable pitch, also oscillator 2 can generate an LFO (called SLO on the unit) or an adjustable pitch. Either oscillator can be turned off if single oscillator operation is desired. A white noise generator provided as well as a four pole filter. 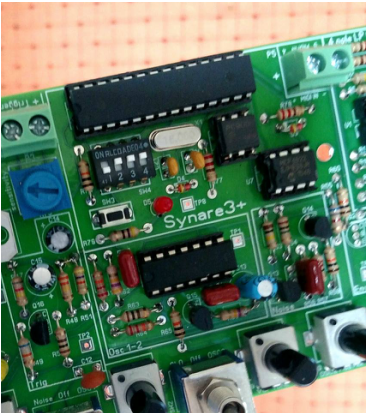 The Syanre 3 has the following controls: Tune (filter frequency), Oscillator 2 level, Sweep, Resonance, and Decay. The final amplifier section has Volume and Decay time controls. The resonance in the filter section can be turned up to produce self-oscillation. The Helensson Synare3 kit includes the circuit board and all components needed to construct the module, along with sockets for the ICs. The only extra items you'll need are knobs and a suitable enclosure. You may even want to get serious and use several of these kits to build a custom system. The circuit board measures only 3" x 7", small enough to install inside many pedal enclosures or even the shell of a small drum. Build your own Synare "UFO" with your own custom enclosure or repair your original unit. All high quality components are used throughout. board dimensions: 7" x 3"